Welcome to the guide on how to fit Neo bay window curtain poles. The Neo Bay window solution has been designed to work at its best with eyelet curtains, but also works with rings. With a choice of 28mm and 35mm diameters in all four Neo colours of Stainless Steel Effect, Chrome Effect, Spun Brass Effect and Black Nickel Effect, this is the perfect bay pole to complement and enhance your interior. Recommended reading: Neo Bay Window Curtain Poles – compatible with heavyweight, eyelet curtains. Download: Neo Bay Pole fitting instructions (PDF). Measure the width of the bay (A) and mark the centre (Fig.1). Place the centre bracket approximately 100mm above the window, remove the cover plates and mark the exact position of the screw holes. Cut the centre pole (we recommend using a pipe cutter) to the width of the bay minus 300mm (to allow for the fitting of the first corner piece). Fit the centre pole into the centre bracket and attach to the wall. (Fig.2). Use the bevel (or protractor) to determine the required angle for the first corner piece. Fit the connectors to the bendable corner piece (Fig.3) and then, with the notches on the inside, bend the corner piece to the appropriate angle. This can best be done over the knee although we recommend placing a towel or cloth over the knee as protection. Do not ‘over bend’ as straightening may distort the profile. To test that the corner piece is bent to the correct angle, fit one end bracket to each side of the corner piece and then connect to the centre pole. If the corner piece has been bent to the correct angle, the two end brackets should sit flush to the wall on either side of the corner (Fig.4). When the corner piece has been bent to the correct angle, disconnect and remove the two end brackets. Re-connect the corner piece and proceed to step 3. To fit the first side of the bay connect the side pole to the corner piece. Slide two end brackets on to the side pole and mark the finished length allowing for the fitting of the finial. 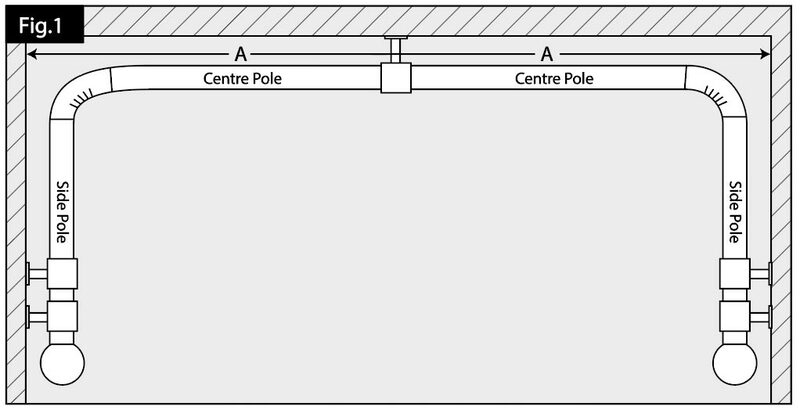 The last end bracket should be fitted approximately 100mm from the desired end of the side pole and the two end brackets should be 70mm apart (inside edge to inside edge) (Fig.5). Mark the exact position of the bracket screw holes and fit the brackets to the wall. Cut the side pole to size. Repeat Steps 2 and 3 for the other side of the bay. To cut the centre pole to the correct length, fit both side poles and attach corner pieces to each. On one side fit the corner piece to the centre pole and on the other side hold the corner piece against the centre pole marking the point at which they will join flush (Fig.6) and cut in situ if possible. Alternatively, you will need to unfix the centre bracket and re-fit once cut. Fit the cover plates to the Centre Bracket (these are magnetic and should easily clip into place) (Fig.7). Allowing for 10 rings (or eyelets) per metre of overall pole length, slide half onto one of the side poles. Fit one ring or curtain eyelet between the two end brackets and one ring (or curtain eyelet) between the last end bracket and the finial (Fig.8). Repeat this for the other side of the bay. When all the rings (or curtain eyelets) have been fitted, each side pole can be connected to the centre pole with the corner pieces. Ensure that the pole is level and secure by tightening the grub screws at the top of each Bracket using the allen key provided (Fig.9), then fit the finials.